Give the gift that keeps giving all year—Music! Children’s Music that Parents and Schools Choose for their Students Because Music Helps Kids Learn Better! Established in 1988, Rivanna Music creates tunes that teach. Music therapist, singer/songwriter, Cathy Bollinger infuses this multisensory effect into her songs. 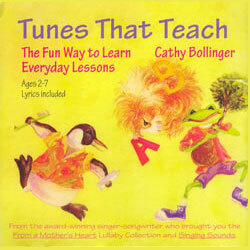 Cathy has written children’s music which is so much fun, kids don’t even realize they are learning. Teachers and parents like Cathy’s music as much as their little ones do! 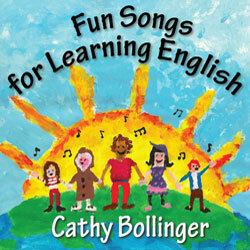 Cathy Bollinger has been working with children through music for more than 20 years. Beloved by her young audiences, she holds songwriting and teacher workshops, practices music therapy and performs. 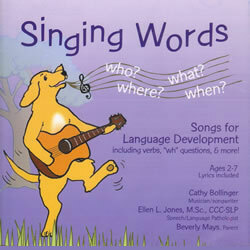 Bollinger received her Master of Arts in Creative Arts Therapy from Drexel University College of Medicine (formerly Hahnemann Medical School) in Pennsylvania, and can often be found in the classroom, singing with preschool and elementary audiences and helping teachers to use the songs with their curricula. Cathy and her business partner, Elly Tucker are committed to helping children by creating tunes that teach social skills, reading skills and other important daily living and school readiness skills. The winner of FOUR Parents’ Choice Awards, as well as the National Parenting Publications Award (NAPPA) for children’s music, Rivanna Music has earned ”Parenting Magazine Pick” for the past 2 years and our music has been acclaimed by the American Library Association’s Booklist, School Library Journal and Autism Spectrum Quarterly. Cathy has just finished work on her NINTH and newest CD, Ready to Learn! 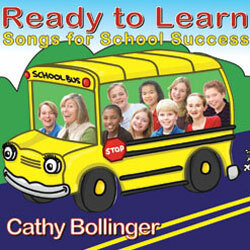 Songs for School Success It has just arrived! Parents and teachers are all abuzz about the exciting response with children that is resulting from Ready To Learn! Get on the bus...get one today! Cathy’s new inservice/workshop, entitled ”Rhythm, Rhyme, and Repetition: A Workshop for Preschool and Early Elementary Classroom Teachers” is available for your community. She has led these workshops for the New York Public Libraries, Core Knowledge Foundation, Virginia Public Schools and Title I Programs. Cathy and Elly were invited as Keynote Address by The Wyoming Children’s Action Alliance for their STARS Conference (Statewide Training Resource System). Please contact us for more information on doing workshops and/or presentations. This was a delightful experience! Cathy combined elements that entertained, educated and engaged the children. Activities included making musical instruments, sing a longs, drumming circle with a variety of instruments and song writing. We were especially impressed with her ability to lead the group through the song writing process--fabulous experience for the kids and the parents who were present. Cathy created and maintained a very positive and energetic atmosphere throughout the session. We look forward to working with her in the future! We are most excited to share with you our great NEWS. For 2 years, we have been working with Mayer Johnson to produce a companion book to our best selling CD, MY TURN YOUR TURN: Songs for Building Social Skills. The CD has taken the world by storm and has been acclaimed by groups and individuals, like Tony Attwood and Carol Gray that support people and families affected by Autism, Developmental Disabilities, Down Syndrome, and other challenges to learning using more traditional approaches. And now, we would like to introduce the book to you. The purpose of the book is to provide teachers, parents and therapists a practical guide to accompany the musical compilation of MY TURN YOUR TURN: Songs for Building Social Skills. These great supporters of our music have been asking us for visual support, activity ideas, guitar chords and Boardmaker © pages, which will increase the accessibility to many children. Social interactions can be challenging to children, especially those with Developmental Disabilities, Autism and Down Syndrome. Music provides a safe, predictable and satisfying way for children to practice these skills. 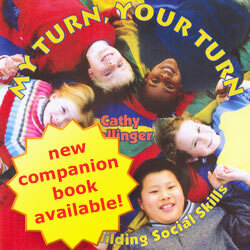 See the My Turn, Your Turn page to download a sample pdf or to order the book. Music is a great gift for yourself, your kids, your friends, and your children’s teachers! Lyrics to “We’re Going to the Playground” and “All My Friends are Here Today”, written during The Promise Center Workshops are under the Programs /Workshops Tab at the top of this page. MY TURN YOUR TURN: Songs for Building Social Skills Songwriter Cathy Bollinger, in collaboration with Elly Tucker, has crafted fourteen songs to reinforce necessary and often lacking social skills such as saying ‘hello’ when you meet someone; taking turns; saying "excuse me" to get people's attention; and making eye contact. Lyrics are included and can be a tool for teaching social skills in a fun way. 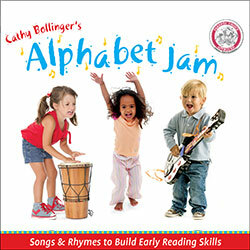 Alphabet Jam: Songs and Rhymes to Build Early Reading Skills "Cathy Bollinger brings her songwriting talents, and experience as a trained musical therapist to the imaginative and informative song-lessons of Alphabet Jam. 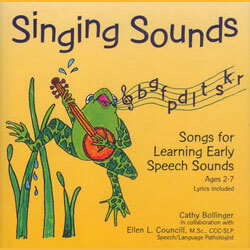 Each song is fun and easy to remember, while quietly teaching essential reading concepts." 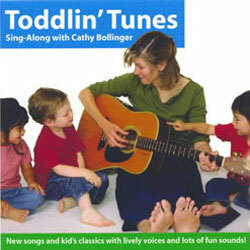 Toddlin' Tunes..."Tried-and-true children's songs may seem somewhat out of fashion these days, with the growth of dynamic new material from many outstanding children's artists in recent years. 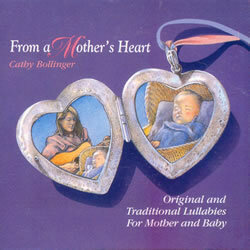 Singer-songwriter Cathy Bollinger, however, knows the value of "tried-and-true" delivered professionally and sweetened with uncloying mom-coziness. " 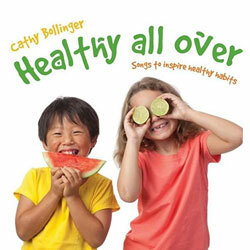 Without rendering preschool favorites unfamiliar to little ears, and accompanied by the voices of children, Bollinger deftly gives them her own creative spin, adding new lyrics and musical surprises to "Patty Cake," "The Muffin Man," "The Wheels on the Bus" and other classics. Her own gentle songs, crafted with the same warmth and lilt, are just as accessible-and as easy on adult ears.